Everyone knows the feeling. You just finished the first US release of Hunter X Hunter since 2014 and the last one until who knows when. You just saw the introduction of the Gold Ninja Steel Ranger in a one-hour special that will be the last episode of Power Rangers until September. You’re still reeling from the feels brought on by Digimon Adventure tri. 's latest chapter. You’re still waiting for iZombie to return. And don’t even get me started on Kingdom Hearts. If you love something that takes long breaks in between releasing content then you’re living in a fandom on hiatus and it can be a pretty gloomy time in your life. Here are a few tips to survive. Be a glass half full kind of person and look to the future instead of harping on the past. Yes, you may have to wait long for something you love, but the wait will build hype and those new episodes will be even better. Power Rangers has, for the past few years, been in an 8/12 split where a large stretch of time will follow episode eight. That can seem tough, especially when episodes as skipped for Spongebob marathons and the Worldwide Day of Play (also known as International Switch to Cartoon Network Day.) However, have hope in knowing that after the hiatus there will be 12 straight weeks of nonstop Ranger action! Positivity is the best way to get through a hiatus. If you truly love something, then you just can’t wait for it to be back. Don’t punish yourself or the thing you love by constantly complaining about how Nickelodeon decides to air episodes that were produced a year ago. A hiatus may be a good time to grab a fellow fan and talk about what you’ve seen and what’s to come. Or grab a friend and introduce them to your favorite show… well then they’d be stuck in Hiatusville too, but at least you’ll have a buddy. Are you waiting for episode 57? Why not go back and rewatch episodes 1 through 56? Hunter X Hunter is the only manga I regularly buy physical copies of, so the rolling hiatus is at least good on my wallet. The break can be a good time to get caught up on previous installments. If you take your time you may be able to stretch them out to the point where you don’t even notice the hiatus. With somethings, going back can mean going waaay back. Plenty of franchises like Doctor Who and Super Sentai have decades worth of stuff to go back and check out. 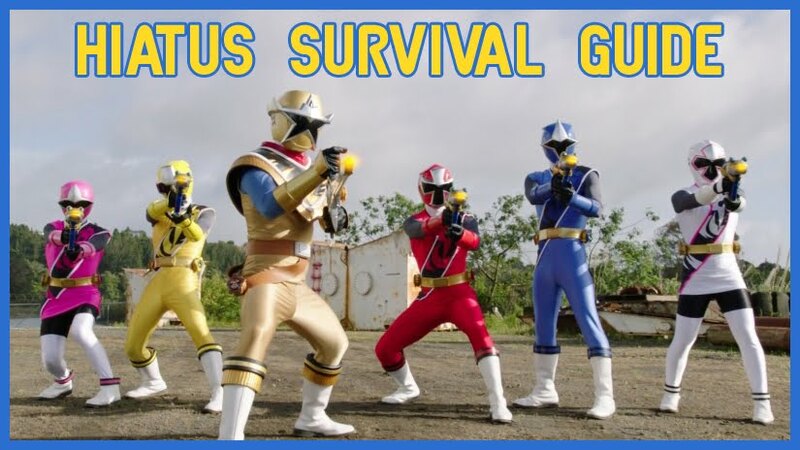 (Not that Super Sentai has ever had a hiatus.) If you haven’t seen every episode of Power Rangers, take the time off to check out RPM or Time Force. I don’t think I could handle a new episode of Power Rangers every week. I even took a few weeks off of my favorite Super Sentai during obvious filler arcs. Take this time to explore something new in a related genre or from the same creator. Can’t wait for new episodes of Game of Thrones or your favorite CW Superhero Show? The BBC’s Merlin is both! Too excited for more of Marvel’s new Spider-Man? Check out The Spectacular Spider-Man, which is one of the best animated series of all time. Still waiting for more Kingdom Hearts III? Well… God bless you. Nobody likes a hiatus, especially when the end date is uncertain. But if you stay positive and fill the void with something else, the wait can be worth it and before you know it your show will be back before you know it.